How does reading proficiency correlate with a student's socio-economic status? Why is this question important? The value of a nation's education system is measured by how well it serves all of its children, not just those fortunate enough to attend a model school or live in a high-performing school district. One of the more important student categories is socio-economic status, especially as the percentage of students from low-income families is growing. A recent report from the Southern Education Foundation (2015) documents that, for the first time in recent history, the majority of children attending public schools come from low-income families. The data also show a steady growth in this trend over the past 25 years: 32% of students were from low-income families in 1980; 38% in 2000; 42% in 2006; 48% in 2011; and 51% in 2013. It is critical that the education system track and evaluate how well students from low-income families perform, the trend of this performance, and the gap between low- and high-income student performance. To calibrate the National Assessment of Educational Progress (NAEP), the National Center for Education Statistics (NCES) secures recommendations from policymakers, educators, and members of the general public for specific achievement levels for each subject and grade. The following are benchmarks for student performance: Advanced represents superior performance, proficient represents solid academic performance, and basic denotes partial mastery of prerequisite knowledge and skills fundamental for proficient work at each grade. Proficiency becomes a critical benchmark because it is the level at which students have met the target standards for a subject area. (Gorman, 2010). It is also the benchmark by which No Child Left Behind (NCLB) holds school districts accountable (NCES, 2011c). NAEP achievement scores can also be disaggregated by socio-economic status. One way of identifying a student's socio-economic background is whether or not the student qualifies for the National School Lunch Program (NSLP). Children may qualify for either free or reduced-price lunch based on family income. Free lunch eligibility represents the lowest income families. Figure 1. 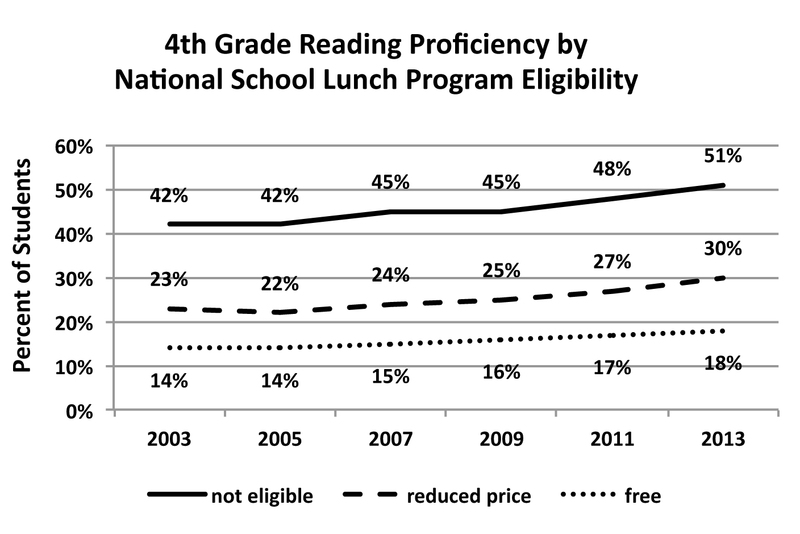 4th grade reading proficiency by national school lunch program eligibility. Results: Figure 1 displays reading proficiency scores for 4th grade students by family income. Students not eligible for NSLP represent the highest family incomes, students who qualify for reduced price lunch come from families of lower income, and students who qualify for free lunch represent the lowest family incomes. The data show several patterns. The most recent data on reading proficiency (2013) show a distinct gap in performance that correlates with students' family income. While 51% of 4th grade students from higher income families read at proficiency, only 30% of students from lower income families achieved proficiency. Students from the lowest income families were at an extremely low proficiency rate of 18%. This pattern is present for the entire 10-year period. The reading proficiency rate improved very slowly over the 10-year period. The rate of improvement correlates with family income. The reading proficiency of students from families with higher income improved by 9 percentage points, while lower income students improved by 7 percentage points, and the lowest income students by only 4 percentage points. Figure 2. 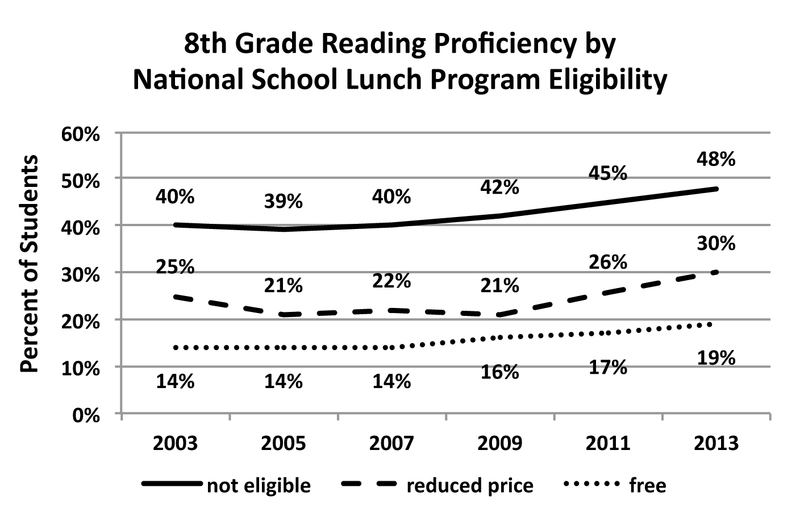 8th grade reading proficiency by national school lunch program eligibility. Figure 2 displays reading proficiency scores for 8th grade students by family income. The data show the same patterns as for 4th graders. Reading proficiency and improvement in reading proficiency over time are highly correlated with a student's family income. In 2013, 48% of 8th grade students from higher income families read at proficiency levels as opposed to 30% of lower income students and 19% of the lowest income students. The reading proficiency of the highest income students increased by 8 percentage points over the 10-year period versus 5 percentage points for lower income students and 5 percentage points for the lowest income students. Figure 3. 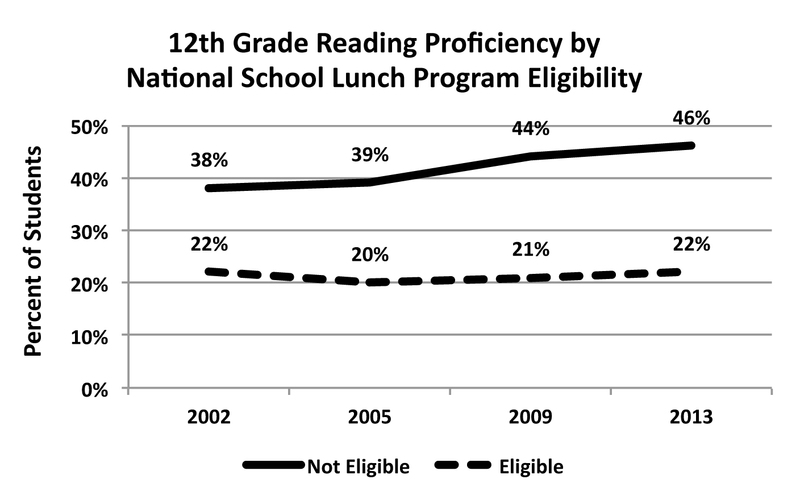 12th grade reading proficiency by national school lunch program eligibility. Source: Data retrieved from Data Explorer for Main NAEP, NCES. NSLP data for 12th grade students are available for only two categories of students: those eligible and those not eligible. The trend from the 4th and 8th grades continue through the 12th grade. In 2013, 46% of higher income students (those not eligible) were proficient in reading. Only 22% of lower income students (those eligible) were at or above proficiency level. The trend over the graphed period showed the same pattern. Higher income students' proficiency improved by 8 percentage points versus no improvement for lower income students. One of the objectives of school reform initiatives is to close the gap in performance between students of different socio-economic status. Figure 4 examines this gap between the highest and lowest income students for both 4th and 8th grades. Figure 4. 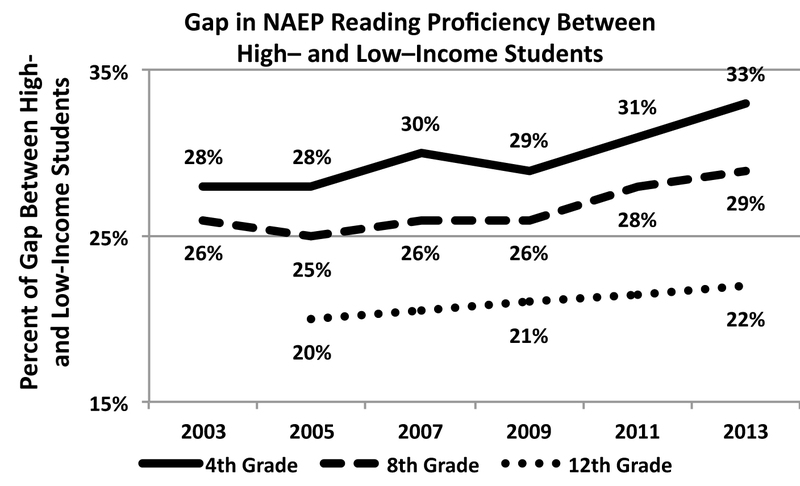 Reading proficiency gap between high- and low-income students. Custom Data Table; Data Retrieved from Data Explorer for Main NAEP, NCES. The data in Figure 4 show a large and increasing gap in reading proficiency between students from high-income families and those from low-income families. In 2013, the gap for 4th graders was 33%, an increase of 5 percentage points over the 10-year period. During the same year, the gap for 8th grade students was 29%, an increase of 3 percentage points, and the gap for 12th grade students 22%, an increase of 2 percentage points. Across all grades, students from families with higher incomes continue to be more proficient in reading than students from lower income families. The improvement over time among students from higher income families is greater than among students from lower income families, resulting in an increasing gap between the two groups. The bottom line: In the current education system, the lower a student's family income is, the poorer the student's reading performance. Implications: Education is increasingly referred to as the civil rights issue of our generation. Few social institutions have more impact on the health and well-being of a nation's citizenry. As a culture, we hold the assumption, codified in federal and state laws, that all students have access to an equal and effective education. Yet NAEP data suggest that this isn't true when it comes to a student's socio-economic status. The percentage of students reading at proficiency level in 4th and 8th grades varies according to family income, with poorer students much less proficient. The fact that the gap is growing wider suggests an even larger problem, as more than half of the students in public K–12 schools are now from low-income families and typically perform worse on NAEP tests. This situation is particularly problematic because research tells us that children who fall significantly behind in reading at an early age have a very small chance of catching up (OECD, 2012). Study Description: NAEP has often been called the gold standard for standardized academic testing because of its constant rigorous scrutiny (Gorman, 2010). Established in 1964, with the first tests administered in 1969, NAEP provides a continuing assessment of what American students know and can do in math, reading, science, writing, the arts, civics, economics, geography, and U.S. history. NAEP is administered by NCES, a division of the Institute of Education Sciences in the U.S. Department of Education. Panels of technical experts within NCES and other organizations continually scrutinize tests for reliability and validity, keeping them similar from year to year and documenting changes. NAEP is one of the few common metrics for all states, providing a picture of student academic progress over time. The richest set of student achievement data come from NAEP, which provides data on subject matter achievement in two ways: scale scores (long-term trend assessment) and achievement levels (main NAEP assessment). The long-term trend assessment makes available test data in mathematics and reading going back to 1970, with test scores by age (9, 13, and 17). The main NAEP assessment reports test results on 12 different subject areas going back to 1992, with student data by grade (4, 8, and 12). Gardner, D. P., Larsen, Y. W., Baker, W. O., Campbell, A., Crosby, E. A., Foster, C. A., Jr., ...Wallace, R. (1983). A nation at risk: The imperative for educational reform. An open letter to the American people. A report to the nation and the secretary of education. Retrieved from http://www.eric.ed.gov/ERICWebPortal/detail?accno=ED226006. National Center for Education Statistics (NCES). (2013). The nation's report card. A first look: 2013 mathematics and reading. Custom data table 4th grade reading. Retrieved from http://nces.ed.gov/nationsreportcard/naepdata/report.aspx?app=NDE&p=1-RED-2-20133%2c20113%2c20093%2c20073%2c20053%2c20033%2c20023%2c20003%2c20002%2c19983%2c19982%2c19942%2c19922-RRPCM-TOTAL-NT-ALC_BB%2cALC_AB%2cALC_AP%2cALC_AD-Y_J-0-0-37. National Center for Education Statistics (NCES). (2013). The nation's report card. A first look: 2013 mathematics and reading. Custom data table 8th grade reading. Retrieved from http://nces.ed.gov/nationsreportcard/naepdata/report.aspx?app=NDE&p=2-RED-2-20133%2c20113%2c20093%2c20073%2c20053%2c20033%2c20023%2c20003%2c20002%2c19983%2c19982%2c19942%2c19922-RRPCM-TOTAL-NT-ALC_BB%2cALC_AB%2cALC_AP%2cALC_AD-Y_J-0-0-37. National Center for Education Statistics (NCES). (2013). The nation's report card. A first look: 2013 mathematics and reading. Custom data table 12th grade reading. Retrieved from http://nces.ed.gov/nationsreportcard/naepdata/report.aspx?app=NDE&p=3-RED-2-20133%2c20093%2c20053%2c20023%2c19983%2c19982%2c19942%2c19922-RRPCM-TOTAL-NT-ALC_BB%2cALC_AB%2cALC_AP%2cALC_AD-Y_J-0-0-5. Organisation for Economic Cooperation and Development (OECD). (2012). Education at a glance 2012: OECD indicators. OECD Publishing. doi:10.1787/eag-2012-en. Southern Education Foundation. (2015) A new majority: Low income students now a majority in the nation's public schools. Retrieved from http://www.southerneducation.org/getattachment/4ac62e27-5260-47a5-9d02-14896ec3a531/A-New-Majority-2015-Update-Low-Income-Students-Now.aspx.